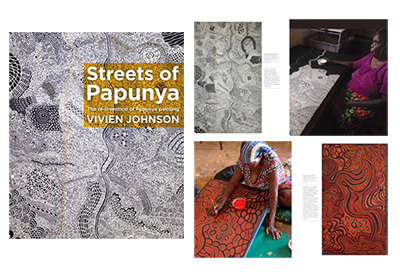 Vivien Johnson's Streets of Papunya has arrived at RMIT Gallery in Melbourne on its Australian tour. Developed to accompany her beautifully illustrated book by the same name the exhibition features paintings by the men who founded the desert art movement, along with works by their daughters. 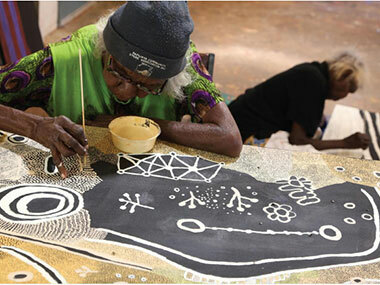 Vivien has shown remarkable devotion to Papunya. As Will Owen wrote in his review of Streets of Papunya (published a month before he died): "Johnson's allegiance to the town of Papunya itself has not wavered over four decades since she and her husband at the time, the artist Tim Johnson, trekked out to the settlement to investigate the new art movement that was taking shape there." That loyalty even led to her helping establish the Papunya Tjupi Art Centre which would enable the children of the great Papunya Tula artists to recover "their mojo" after their painting had died. Jeremy Eccles, who attended the Sydney exhibition, said there were "some exciting names emerging - Candy Nelson Nakamarra and Dennis Nelson Tjakamarra, and Isobel Gorey spring to mind, all are on show...grouped with their illustrious antecedents." This Melbourne show will also feature additional pieces drawn from private Victorian collections. On the other side of the city at fortyfivedownstairs the McCullochs are set to run an exhibition to be opened by artist Isobel Major Nampitjinpa. Called Keepers of Place this exhibition will feature new works from the Papunya Tjupi Arts Centre. A floor talk is scheduled for Saturday 28 May at 2.00pm. Keepers of Place will run from 24 May to 4 June 2016.